K1S1 takes you on an extreme knitting adventure! Short for Knit One Share One, K1S1 is made in New Zealand from high grade merino wool. It is super soft, beautiful against the skin, and of course, humungous! 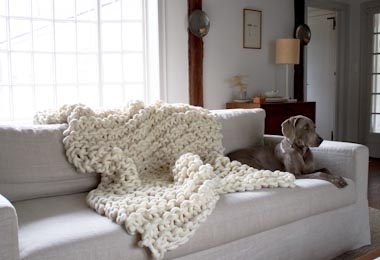 K1S1 is a fully felted knitting yarn designed specifically for blankets, garments, and creativity. It's not well suited for rugs but is well suited for people with a propensity for throwing out the rule book and trying something new. This 5kg bump contains enough yarn to make a throw that measures approximately 47 x 63 inches. It comes only in White, but other natural colors are available in K1S1's 1.5kg bumps. Knit this yarn with your hands and arms, or pick up a mega set of K1S1 Industrial Knitting Needles and get extreme knitting!